The term “social media” is bandied around on a daily basis yet, more often than not, it is misinterpreted or misunderstood. We will define social media and how it relates to marketing and promoting brands. We will also provide real examples that prove a healthy return on investment is possible when social media is fully understood and used in the proper manner. Likewise, we will provide examples that explain why so many organisations are wasting their time, and ultimately failing, with social media. The November breakfast will explore what social media actually means. We will define social media in a business context and try to dispel some of the myths. Most people understand what social media is on a personal level however, when it comes to business, the definition is less clear. How do you apply the principles of social media to your business and how do you get a return on your investment? Hopefully we will be able to help you understand what social media marketing is all about and how you might be able to use it within your business. We will also explore how you choose what tools to use and how you can become ‘trend proof’ if you adopt the right social media strategy. 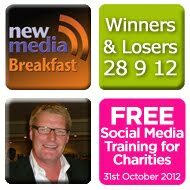 Gordon White, Managing director of fatBuzz Ltd will present the November New Media Breakfast.